Looking for more tips on how to shop in Paris like a local? Be sure to get our 2019 INSIDR Paris Shopping Guide! Perfect shot of the Eiffel Tower – check. Tasted Paris’ best croissants and crêpes – check. Visited the Louvre, Versailles and Montmartre? Check, check and check. As your time in Paris comes to an end, there is one important item that you don’t want to overlook – Paris souvenir shopping! Whether you’re looking for cheap Paris souvenirs for budget travelers, Paris supermarket souvenirs for food lovers, Paris beauty souvenirs for beauty lovers, searching for Paris Saint Germain store for football lovers, we’ve put together our best ideas and addresses for you! Read on for our top tips on Paris souvenir shopping. The charming Montmartre neighborhood or classic bouquinistes are a good starting point. 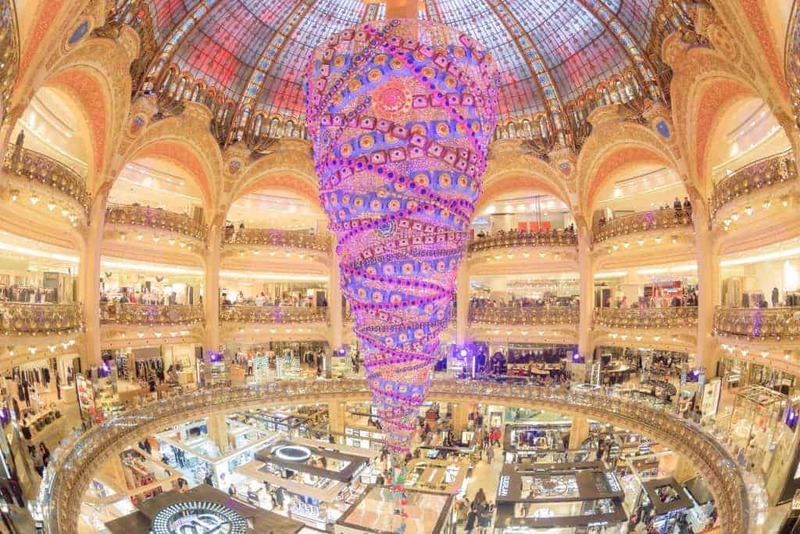 However, for one stop souvenir shopping the Galeries Lafayette department store is our top pick. You’ll find souvenirs for food lovers, including foie gras, delicious French sauces and dressings as well as classic French cooking ingredients (truffles, anyone?). There is also of course a fantastic selection of wine, French cosmetics, gear for football lovers and more! French perfume and other French beauty products are also perfect souvenirs. 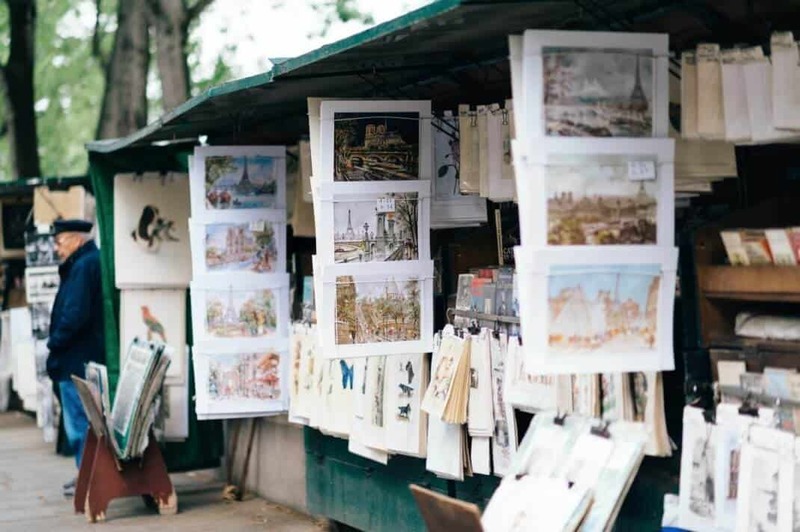 One of the best places to shop for souvenirs is the lovely Montmartre neighborhood. Not only is it one of the city’s most iconic areas, with its share of hidden gems, it has great souvenir shops. 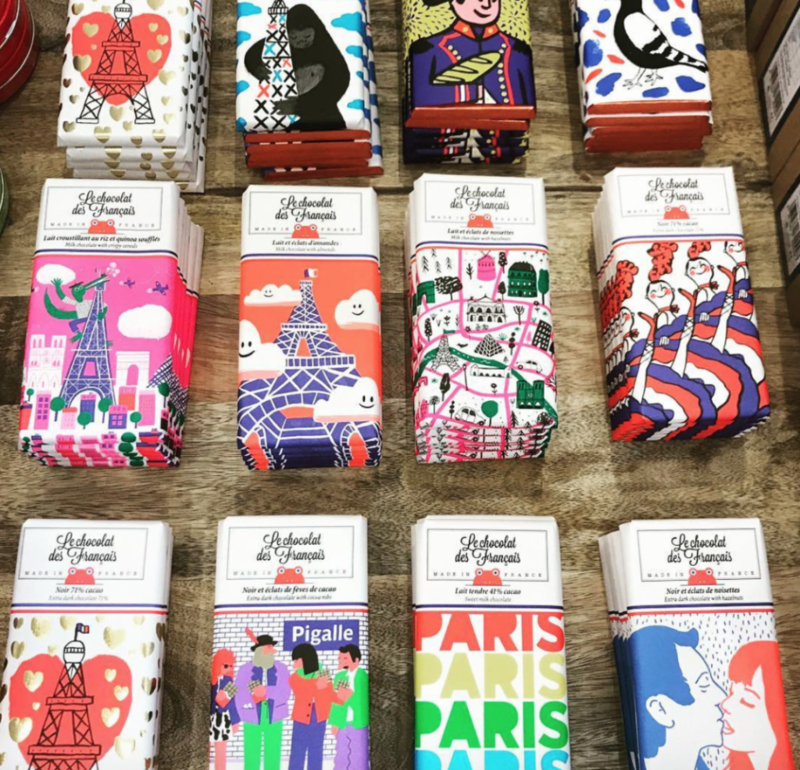 For a sweet souvenir, head to either Le Petit Musee du Chocolat or La Cure Gourmande to bring a taste of Paris home with you. Unique, whimsical gifts can be found at Paperdolls. The store features exclusive items from 20 different Parisian designers. There is also of course the official Moulin Rouge store, a must-visit! 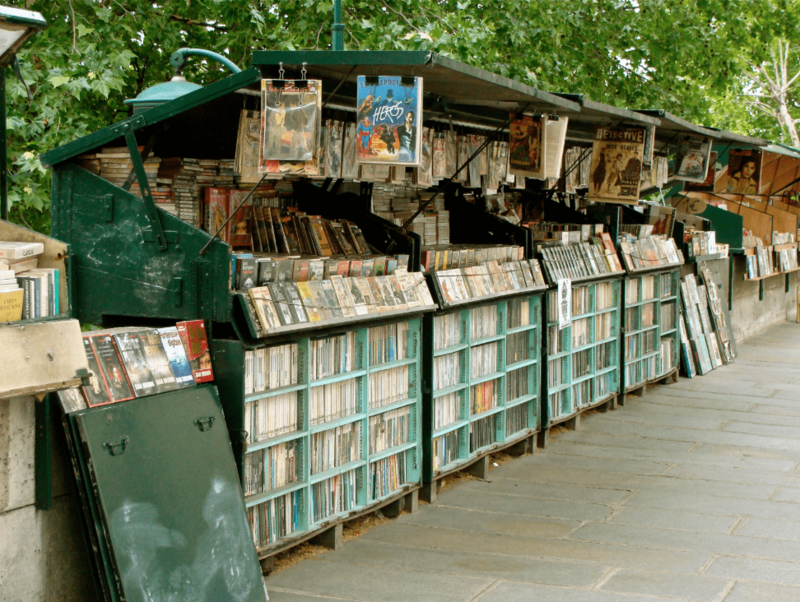 The bouquinistes (used-book sellers) along the Seine river near Notre Dame have been a fixture of Parisian life since the 1500s. Not only is visiting the bouquinistes a uniquely Parisian experience, they make wonderful souvenirs! You’ll come across a wide variety of books, from popular novels to old pamphlets and vintage advertisements. The shops and stalls have flexible hours, but most tend to be open on Wednesdays as kids are off from school. Souvenir shopping is one of our favorite parts of traveling. Picking out the ideal items so that you can always have a reminder of Paris as well as finding the perfect gifts for your loved ones back home. But here at INSIDR, we also like when things are convenient. The shopping in Paris is excellent but the city has so many stores that Paris souvenir shopping can become overwhelming and time consuming. We definitely recommend going to a department store where you can get everything in one go – without forgetting a single item! Personally, we recommend the Galeries Lafayette as they have clothes, cosmetics, an awesome gourmet grocery store, kids items and more. It’s souvenir shopping made easy. On the 6th floor of the main building, they also have one section dedicated to souvenir shopping with the cutest Parisian items possible: travel size fine chocolate box, Eiffel tower mugs, Paris’ skyline tea towel.. You will find all you need to please your friends and coworkers back home. French cuisine is considered the epitome of international gastronomy. Chefs in France will tell you that using only the best ingredients is crucial for a successful dish. These high-quality ingredients make the perfect gift for all of the foodies in your life. Fleur de sel forms on the delicate crust on the surface of seawater and is the perfect gourmet touch to any meal. Anything truffle is always a hit. 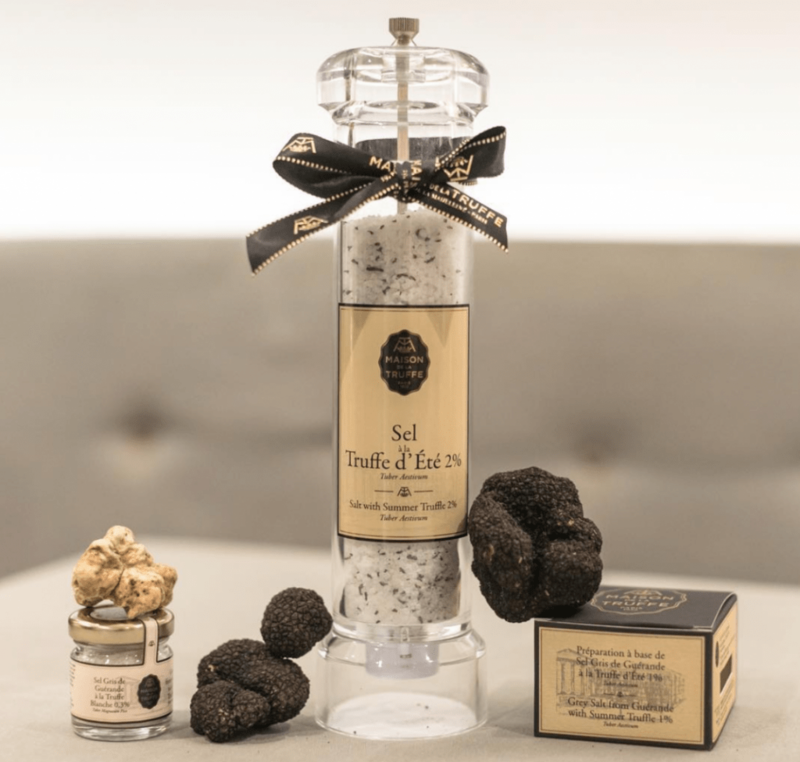 Choose from truffle salt from La Maison de la Truffle, truffle oil or a dried truffle and risotto mix. French mayonnaise and classic Dijon mustard are great ideas as well. You can find all of these items, and many more, at the gourmet section of the Galeries Lafayette. Condiments might not first come to mind when you’re thinking souvenirs, but you should definitely think again! Nothing goes better with a freshly baked baguette than the perfect tapenade. At least, that’s why we think Paris has such a great selection of tapenades. From the classic black olive to sundried tomato or truffle, it’s a tasty memento. Classic French vinaigrette is also a great option. On the sweet side, Caramel Beurre Salé, or salted caramel makes any dessert even better. Though controversial, foie gras is a French delicacy and makes for a wonderful souvenir or gift for those who enjoy it. The thick pâté has an unforgettably rich flavor. Paired with crispy bread, it’s the perfect appetizer for all occasions. The gourmet luxury can be enjoyed whole (entier), cooked (cuit), semi-cooked (mi-cuit), as a mousse, paté or fresh (frais). It’s often served with fig jam and pairs nicely with a white Burgundy wine such as a Meursault or Pouilly-Fuissé. 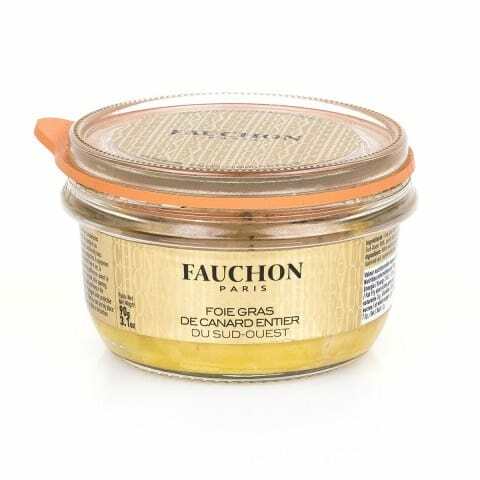 If you’re not sure what kind of foie gras you want or simply would like to choose from the largest selection, Fauchon sells foie gras in a jar that’s perfect for bringing back home! 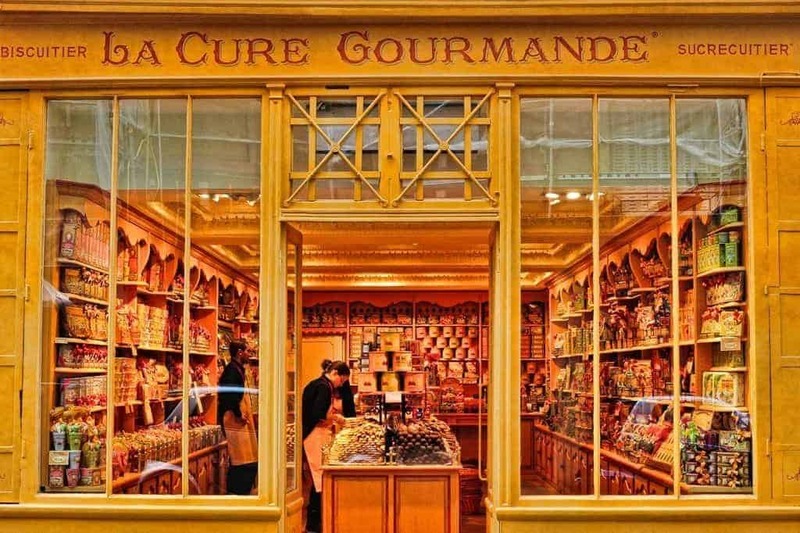 You can find Fauchon and many other French brands at Galeries Lafayette Gourmet. It goes without saying (but we’ll go ahead and say it anyway!) that wine is a wonderful French souvenir. There is nothing quite like opening a local bottle of French wine at home to share with family and friends while telling them about your Parisian adventures. Red, White, Rosé, Champagne…the options are endless. Depending on your tastes, and luggage size, we recommend heading to a speciality cave where the sommelier can help you pick out the perfect bottle or two for you. 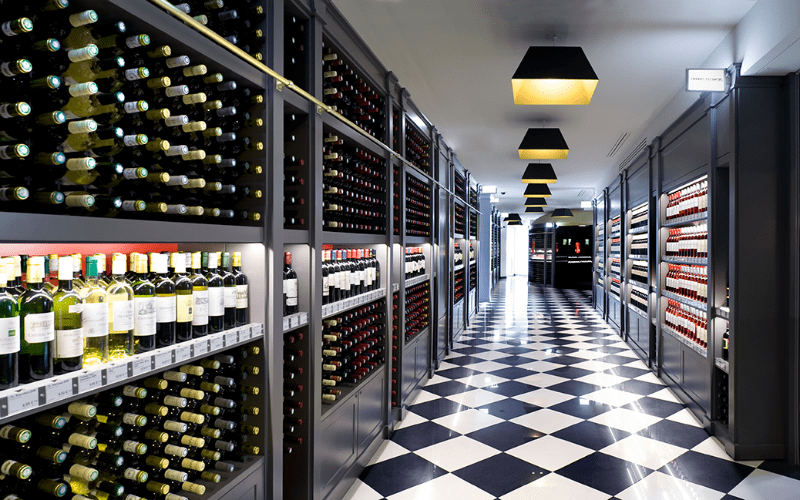 You can score the perfect bottle at Galeries Lafayette’s wine cellar and Bordeauxthèque where you will find more than 2,500 labels of beautifully selected French & international wines and spirits with all price ranges. From prestigious wine producers to local artisans, it’s your call! But don’t worry, the professional vendor-sellers are there to guide you through how to pick the best Grand Cru! For a fancy tea-time treat, go for one of the many delicious French biscuits. They come in tons of different forms from palm trees to cat tongues. One of the most iconic brands if of course Lu with their Petit Ecolier cookie. Bonne Maman is another one, we especially love their lemon tarts and fresh butter biscuits that are as decadent and delicious as they sound! 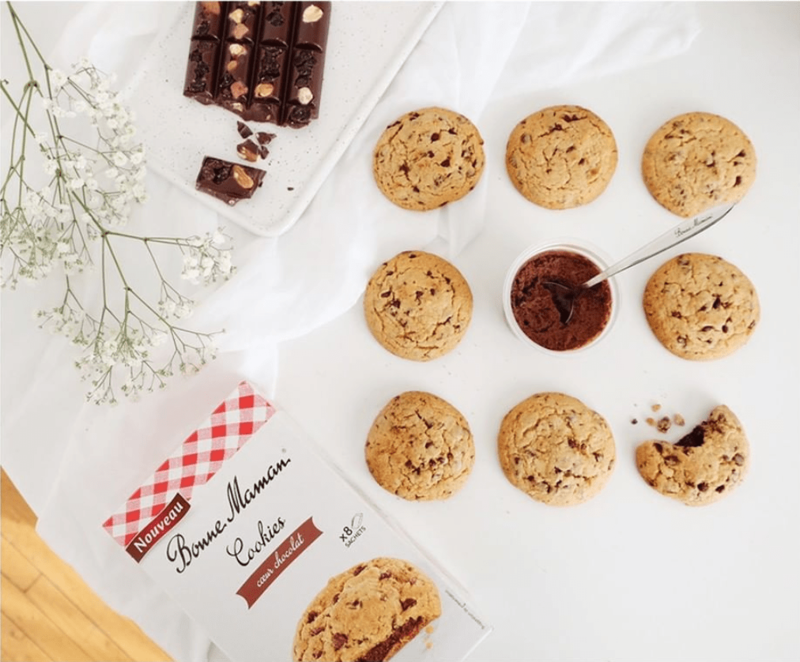 The Monoprix brand also has excellent cookies, including a soft Madeleine and palmiers (palm tree shaped, flaky cookies). Finally, for treats from Brittany, go for the St. Michel brand, the salted galettes are to die for. Whatever you choose, French biscuits make for an excellent souvenir. Our list of souvenirs is looking pretty good, but we can’t go any further without mentioning some of the French favorites. Most of them can be found in local French supermarkets – also a great place to pick up souvenirs. First off, the classic Confit de Canard. The rich dish is available in jars or tins to make travel easier. There is of course Cassoulet, also surprisingly easy to travel with. 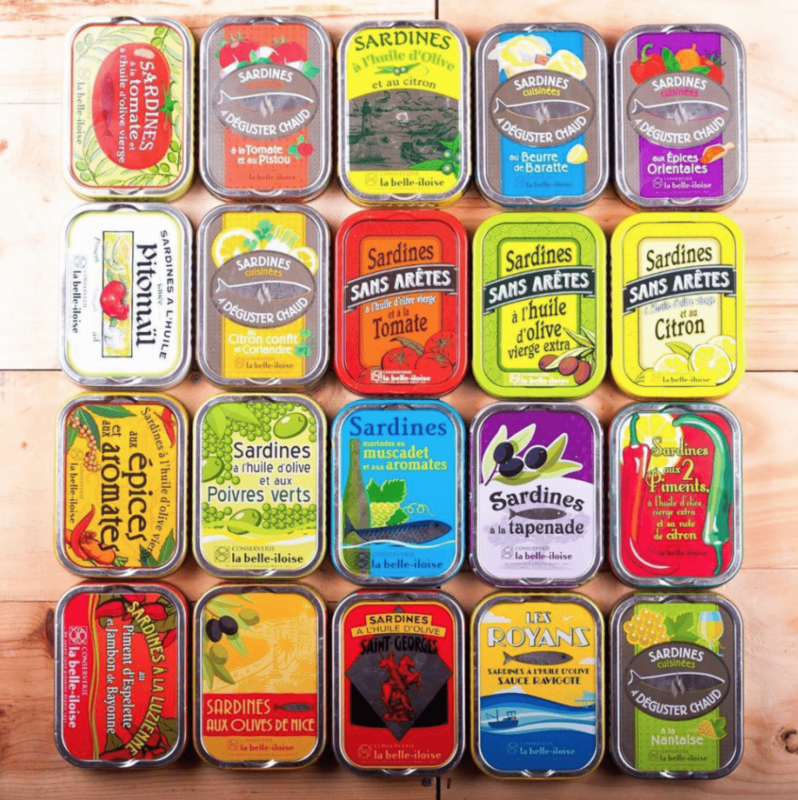 A tin of typical French sardines is a crowd pleaser as well. French jams, especially the Bonne Maman brand, are also an excellent choice and will add a touch of Paris to your breakfast at home. For small size jam, individually packaged typical French snacks, head to Galeries Lafayette’ souvenir section on the top floor. 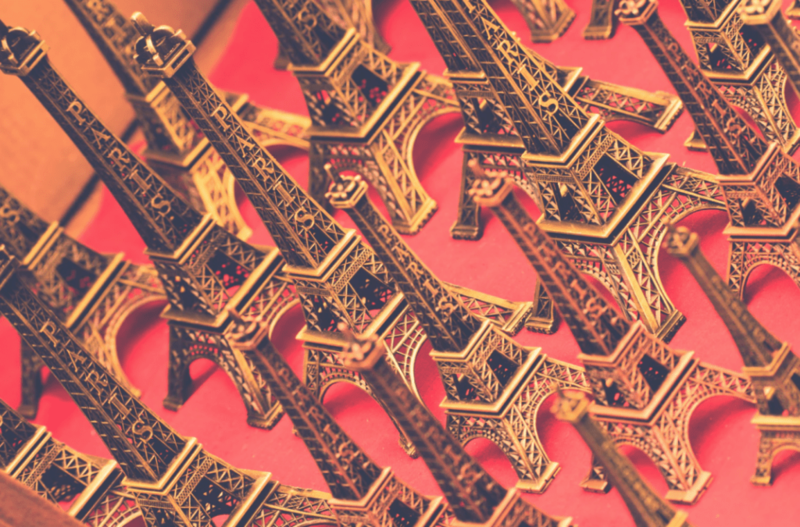 Paris beauty souvenirs – for all beauty lovers! 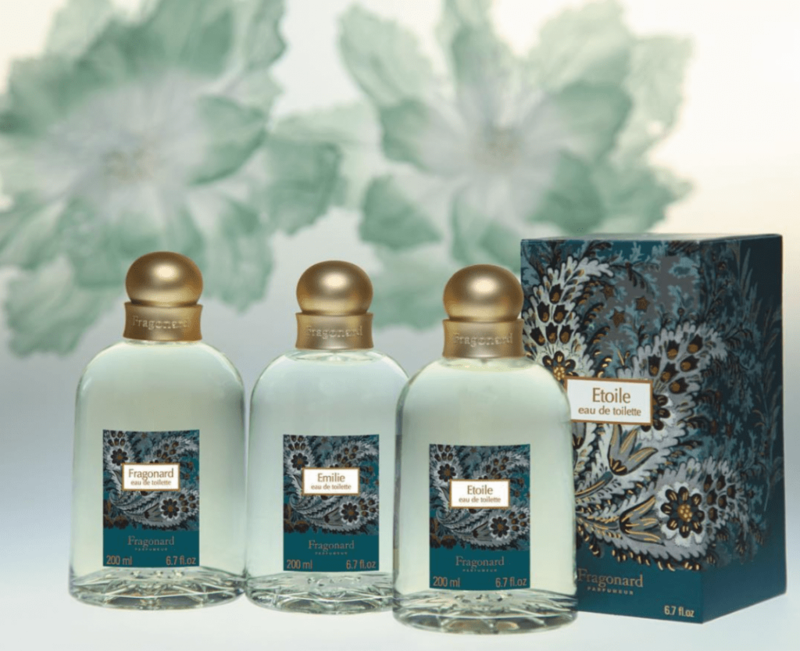 A fourth-generation family affair, Fragonard was created before World War I in the southern town of Grasse, the perfume capital of France. Obsessed with perfection, Fragonard bottles only the purest essences using copper perfume stills. You can visit the Fragonard museum in the heart of Paris, next to the Opera to learn more about the famous Maison. A bottle of Fragonard makes a wonderful memento or gift. Not only is the scent lovely, you can also ask that a handwritten name in calligraphy be added to the perfume package. 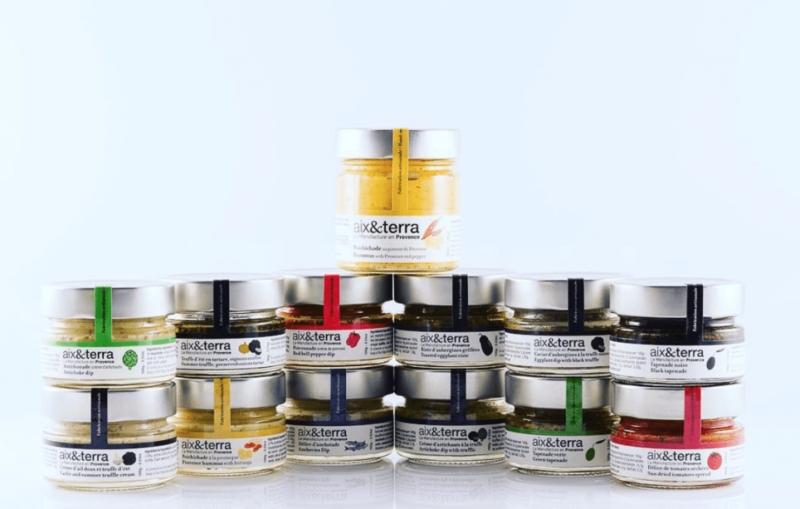 French pharmacy brands blend cosmetology and technology to create amazing skincare products. Top brands are renowned for their efficiency and special products for sensitive and problematic skin. All at reasonable prices! You should definitely stock up on French cosmetics and stopping by a French pharmacy is a must during your time in Paris. 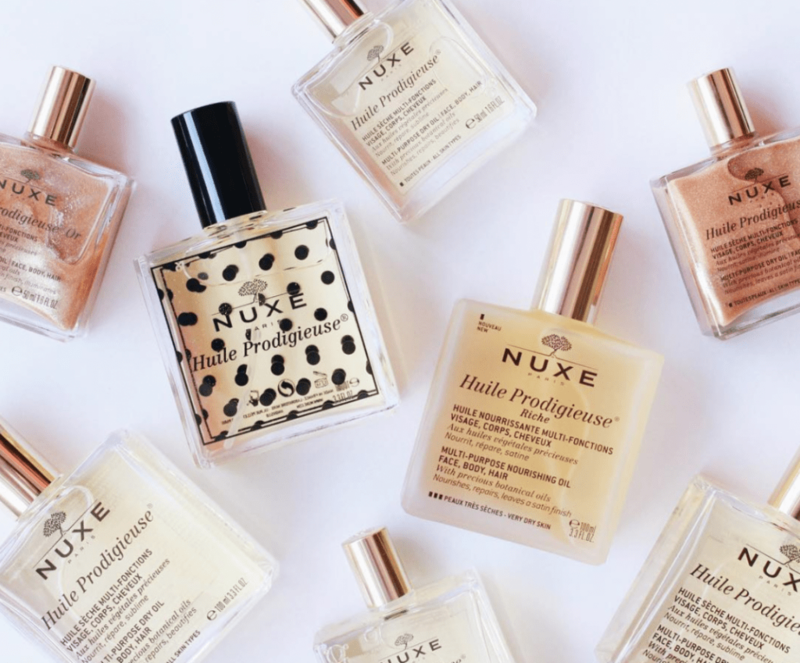 The hand creams, Nuxe multi-purpose oil, Caudalie and Melvita products are must-buys. For beauty-lovers, check out our advice on the top 20 French pharmacy products. Our favorite shop is Parapharmacie Monge – they have a large selection of products and instant tax refund service. The multilingual staff is also super helpful. The French not only take their skincare seriously, but their overall beauty routine as well – including makeup, of course! The French favor high-quality products and a subtle look to enhance natural beauty. 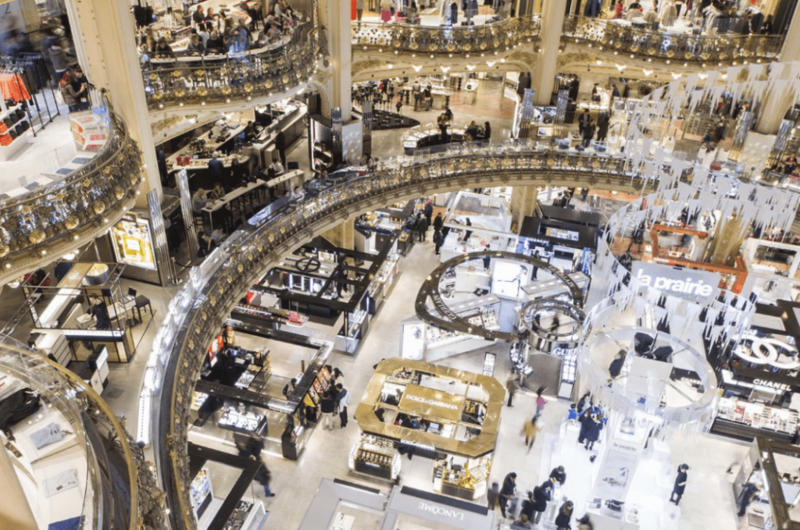 The Galeries Lafayette is or top makeup shopping destination in Paris. Their Beauty Masterclass by Lancôme is a great place to start. Learn the secrets behind the French beauty routine and get practical advice on French makeup techniques. You’ll then be armed with the necessary knowledge to enjoy the Galeries Lafayette’s huge selection of cosmetics brands and products. If you’re looking for a chic and authentic Parisian souvenir, consider picking yourself up a Longchamp bag. 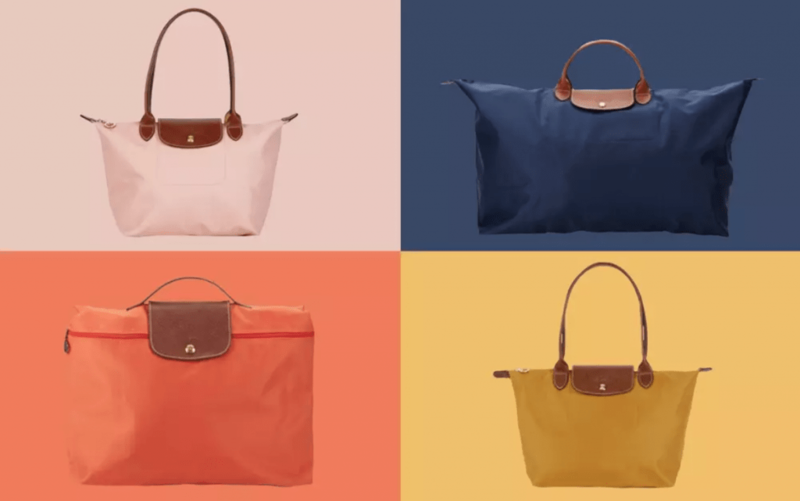 Longchamp was founded in Paris in 1948 and their products have won the hearts of fashionistas, celebrities and the wider public. The “Le Pliage” purse is a great choice. The signature trapezoidal bad with leather handles comes in all sorts of colors and sizes. They’re practical, affordable and stylish. Le Pliage folds up into a small square and is ideal for traveling. The Eiffel Tower version is exclusively available in Paris. Capturing the smell of Paris might not be 100% possible, but some French candle-makers have gotten pretty close! Their elegant candles make perfect souvenirs. Cire Trudon has been making candles since 1693, the elegant fragrances have a royal edge to them. 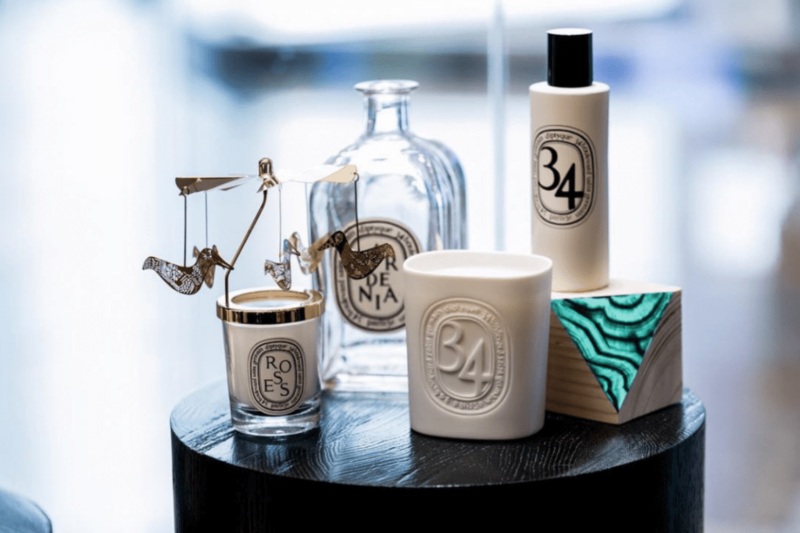 Diptyque is a Parisian icon and can be found in numerous French households. Le Labo and Archipelago also make high-end, beautiful candles that make a lovely addition to your home. Snag your favorite scent in stores located in Les Marais, or at the Galeries Lafayette in the city center. 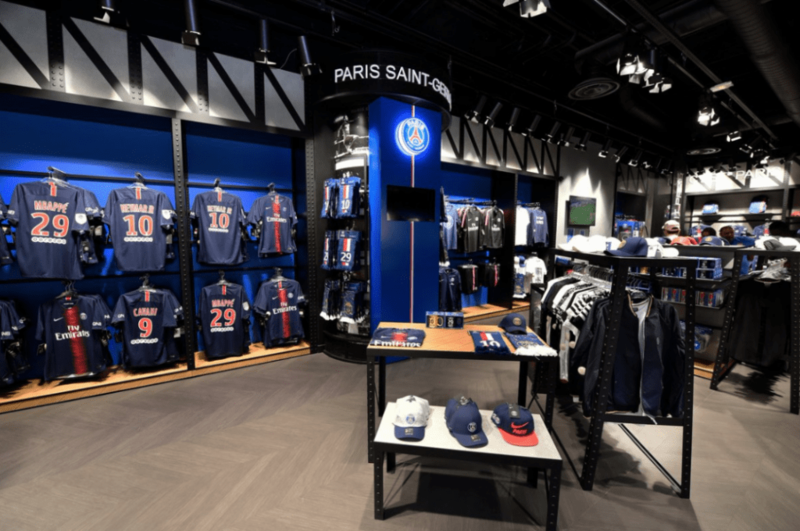 Paris Saint Germain store – For football lovers! Paris Saint Germain is the French capital’s beloved soccer team. The famous club has taken the French league by storm the past few years. With Neymar Jr., Mbappé and Cavani, the team is full of international stars. A scarf, or other PSG gear, is the perfect souvenir or gift for soccer lovers. You can find Paris Saint Germain related merchandise at the Galeries Lafayette or at the PSG store on the Champs Elysées. The official store is often crowded, so we tend to head to the Galeries Lafayette, unless you are looking for a specific item. As a traveler, it is quite usual that you might want to buy some souvenirs and gifts from Paris to give it your friends or simply to keep it to yourself to remember this trip. Bring France Home is the shop that can save you from the cliché selection of travel gifts such as low-quality magnets, shot glasses with awkward prints and lame postcards. The shop has many different items available for every kind of budget. You may find cheese plates from the Faience Manufacture of Gien, locally-designed tee shirts, porcelain tumblers or card games and they are all made in France! You can easily find Bring France Home in Le Marais at 3 Rue de Birague in the 4th arrondissement. Shakespeare and Company is one of the most famous bookstores in Paris. Originally opened by an American in 1919 it become the favorite hangout for expat authors including Hemingway, Fitzgerald, Ezra Pound and James Joyce. The bookstore has changed owners and even locations over the years but has maintained its antiquarian charm. The free reading library remains open to the public and the famous store cat, named Kitty, can be found roaming around as well. Numerous movie scenes have also been filmed in and around the store. 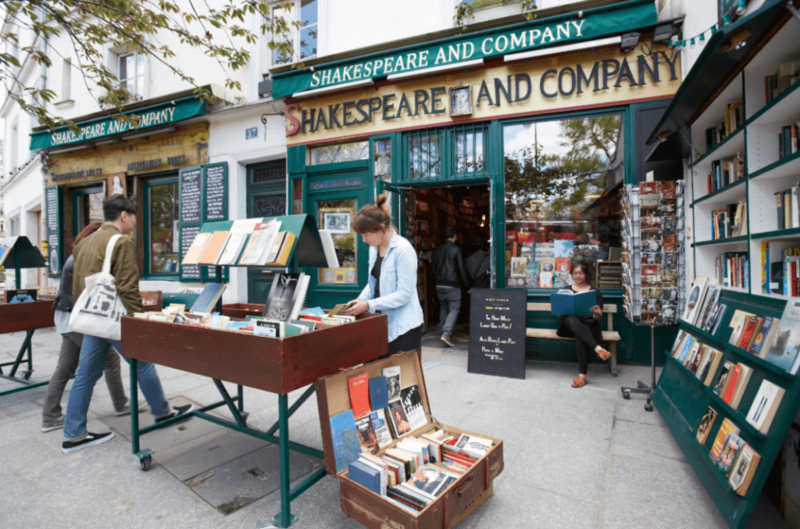 It’s the perfect spot to pick up a literary souvenir from Paris. 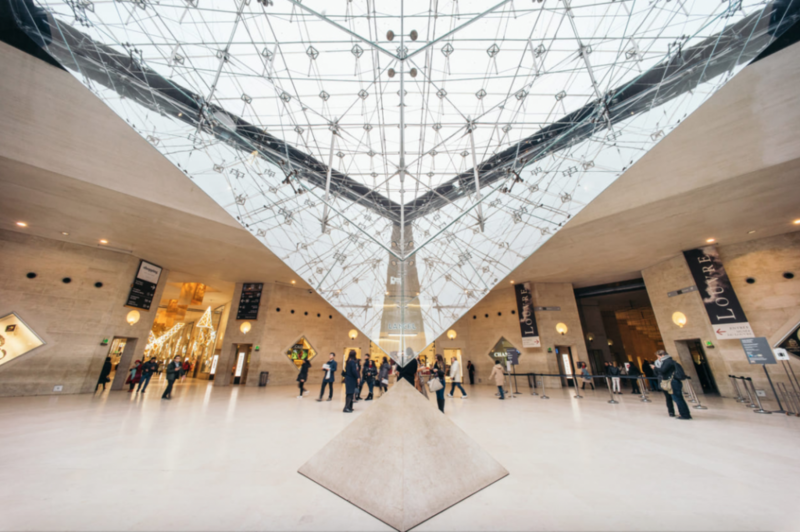 Don’t forget to stop by the stores in the Carrousel du Louvre after visiting the famous museum. The Carrousel was opened in 1994 and is full of shops with hundreds of typically French brands and products. You’ll find traditional products as well as unique items that make awesome souvenirs. We especially love Pylones, Perigot and the Comedie Française stores as well as cosmetic brands including Caudalie and Fragonard. If you visit the catacombs, definitely stop by the store on the way out. The same goes for the Picasso Museum and the Musée du Parfum. Going to the theater and catching a show at one of city’s famous cabarets are must-dos for the perfect Paris experience. 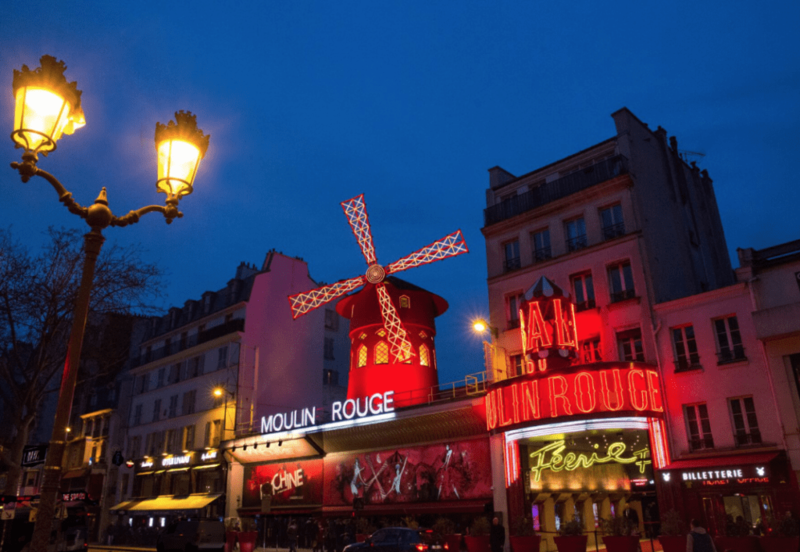 From the magnificent Opera Garnier to the smaller theaters around Grands Boulevards, there are hundreds of shows to choose from including the famous Moulin Rouge. Theaters and cabarets often have stores, another great spot for souvenirs! As mentioned, the Moulin Rouge official store is one of our favorites. It’s located on rue Lepic, in Montmartre, just a few steps from metro stop Blanche and the famous windmill. Even if you can’t attend the one-of-a-kind show, we definitely recommend at least stopping by the shop!